Lou Reed and Adam & The Ants are artists ardently admired by the members of the English band The Rumble Strips (Tavistock, Devon). 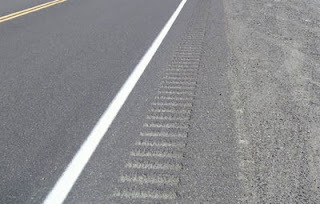 A rumble strip is the narrow, ribbed strip of asphalt that runs in a longitudinal direction along the roadway. Those driving their car or motorcycle close to the verge and hitting a rumble strip are warned by the particular sound that produces.